Pratapgad FortHeight : 1100 Mtr. Recognised as one of the gems in the crown of Swarajya, the PRATAPGAD is situated on the western side of the famous hill station, Mahabaleshwar. It lies in Satara district of Maharashtra. The route from Poladpur (on Mumbai-Goa Highway) to Pargaon is called as Parghat, whereas the later portion of the road is called as Ambenali Ghat. This fort enabled to establish a good control over these Ghat sections. The river Koyna flows at the foot-hills of this fort. The surrounding of the fort is covered with thick forest which is famous by the name, �Jawali�. This fort was initially recognised as the Bhorpya hill until Shivaji Maharaj completely reconstructed it, which was later recognised as �PRATAPGAD�. 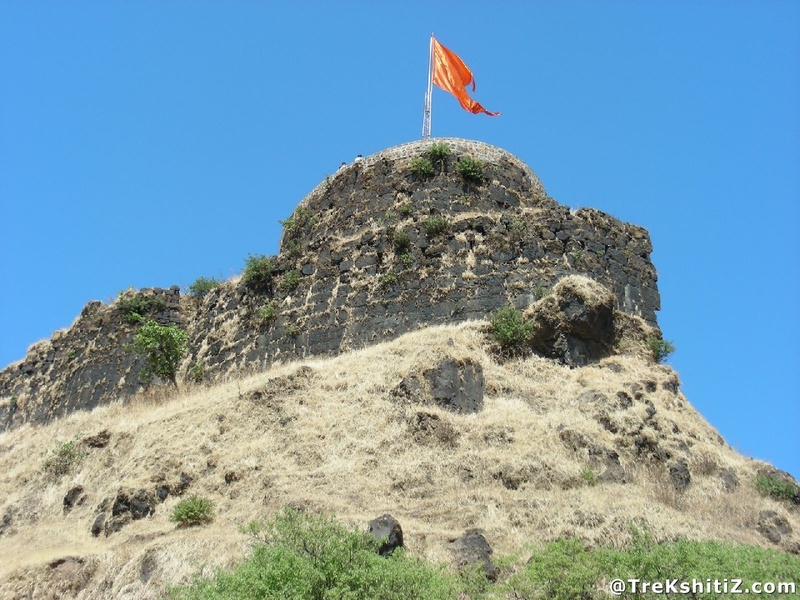 The construction of this fort was done under supervision of Shivaji Maharaj�s Prime Minister, Moropant Trimbak Pingle. (Prime Minister was recognised as �Peshwe� during those days. Peshwe was used as �Title� then). This fort has got significant historic importance due to the the famous temple of �Bhavani Mata�, constructed by Shivaji Maharaj and the event of Assassination of Afzalkhan on it. Assassination of Afzalkhan : The wife of Sultan of Vijapur, known as �Badi Sahebin�, used to efficiently handle all the operations of kingdom of Adilshah. She ordered Afzalkhan to attack Shivaji Maharaj. He was accompanied by infantry along with elephants & horses. When Afzalkhan (henceforth referred as �Khan�) reached Wai, he instructed his lawyer, Krishnaji Bhaskar, to arrange a meeting with Shivaji Maharaj. However, Shivaji Maharaj, who was eventually at Pratapgad, had understood through his detectives that Khan, infact, had come with the intention of killing him. Knowing the strength of armed-forces that Khan had along with him, Maharaj fixed the meeting with Khan at Pratapgad. As a proactive step towards war, Maharaj stationed Netaji Palkar in the forest of Jawali, Moropant Peshwe in Ghats, Shamrao Nilkanth & Trimbak Bhaskar in Konkan region and Haibatrao and Balaji Shilmakar in Bacheghodi Ghat. Their respective troops of soldiers were instructed to come ahead only in the event of war. A �SHAMIYANA�, the tent, was built for the meeting on the plateau of the fort. It was well decorated with gold, silver and diamonds. Maharaj was accompanied by two body guards, namely, Jiva Mahala and Sambhaji Kawji, whereas Khan had Sayyed Banda and other two of his officials with him. When Afzalkhan and Maharaj came in front of each other, Khan spread out his hands in a gesture to embrace Shivaji Maharaj. Khan had a sturdy and stout built as against Maharaj. After hugging Maharaj, Khan cunningly held Maharaj�s neck firmly in his armpit; took out a dagger and attempted to stab Maharaj on his back. Maharaj was very well aware of Khan�s intentions and hence was wearing body-armor. In addition to it, Maharaj was equally prepared and had �Wagh Nakha�, the tiger nails hid in his waist-belt. Soon after the brutal attempt of Khan, Maharaj thronged those tiger nails in Khan�s belly and tore his muscles apart. Khan groaned and shouted for help. Hearing his call, Khan�s men rushed ahead with a palaquin, put Khan in it and started to flee away. At the very moment Sambhaji Kawji arrived at the scene and cut off the legs of those palanquin-bearers carrying Khan; slit Khan�s neck as well. Khan�s body guard, Sayyed Banda, too, rushed at the scene with his powerful weapon, �Patta�, however, it was in vain because Jiva Mahala sliced out his hand which was equipped with weapon. A signal was given by shooting of cannon-balls to Maharaj�s troops, stationed at various positions (as explained earlier) to move at the warfront. A tough war was fought between the duos which ultimately resulted in the defeat of Khan. Khan�s troops had to pay a very heavy price as against defeat. His top officers, prime ministers, along with soldiers were slaughtered in the war. Khan had to also loose quite a substantial number of elephants, horses, cattle and other animals in the battle. Maharaj, on the contrary, gained a lot during the battle. On his account were registered, about 65 elephants, 4000 horses, 1200 Camels, 2000 cloth-bundles, artillery, jewellery and gold coins. This Hastakala Kendra (a retail outlet of handicraft products) is situated enroute from Wada village to Pratapgad. There is also a refreshment centre located within the campus. Enroute to Pratapgad, lies the Tomb of Afzalkhan on the left side of the road. Next to Afzalkhan�s tomb, lies the tomb of his faithful body guard, Sayyed Banda. The tomb is looked after by Afzal Memorial Trust. This is on the western side of the fort. This fortified place is adjacent to the currently existing vehicle parking bay. This Watch-tower was used to keep an eye on the enemy in the surrounding area. A road on the left side of the Watch-tower takes us to the entrance steps of the fort. Mahadarwaja lies here in between the two bastions. Cannon can be seen placed at this door. After taking a left turn from this door, two other doors are visible but they are not in use any more. There are total four lakes on the fort, Rahat lake being the largest among them. On the eastern bastion lie the ponds known as �Naske Tale� and �Gode Tale�. The stone from which Goddess Bhavani Mata�s idol is carved has been brought by Shivaji Maharaj with the help of King Leelasen. This stone was extracted from a mountain situated at the convergence point of three rivers namely; Trishul Gandaki, Shwet Gandaki and Saraswati. The idol of Bhavani Mata has been carved by Nepali craftsmen. Shivaji Maharaj worshiped this idol at first on Raigad fort and then later, with the assistance of Moropant Peshwe, it was permanently established on Pratapgad in 1662 A.D.
Just outside the temple, there are two huge stone pillars having rows of lamps, which are called as �Deepastambha�. Besides it, there lies an Assembly hall (�Sabhamandap�) and inside it, is a �Ghanta Rangamandap�. Infront of the idol, a �Shivpindi� made of transparent crystal stone can be seen. Apart from this, there is a sword of the vice-Senapati Hambirrao Mohite, over which his name is engraved along with a sign of �6 Ribits�. (One ribit was awarded to a person who kills 100 enemy solders). Some recently established refreshment centers can be seen while moving towards citadel. Within those establishments, on a higher platform, is situated a cultural library. It displays olden coins, dresses of people of those days and vintage paintings of Marathi-style. One can also view a 15minutes slide show arranged by the library officials which gives us information about Pratapgad in brief. This temple lies before the entrance door of citadel. The idol of Lord Hanuman was established by Samarth Ramdas Swami. As you enter through the door of the citadel, you come across an open space. This is called as �Sadar�. Important meetings and discussions used to take place on this Sadar. Opposite to this lies the Kedareshwar Temple. As we go ahead from Kedareshwar temple, we comes across a huge statue of Shivaji Maharaj mounted on horse-back with sword in his right hand, raised up towards the sky, and bridle in left hand. This statue has been created by Shri. Kamat, a craftsman from Mumbai, on 30th November 1957. This statue was unveiled by our Late Prime Minister Shri Jawaharlal Nehru. Apart from above mentioned places, there are many other structures, viz., �Yeshwant Buruj� to the east, �Surya Buruj� near Hanuman Temple to the south and besides it lies a secret-doorway, �Rajpaharyachi Dindi�, a place to keep watch-on to the north of the fort. It takes about 3 to 4 hours to see the fort completely. Enroute to Mahabaleshwar from Poladpur, lies a village �Wada Kumbroshi�. Pratapgad is situated at about 4 kms from this village. One has to take a right turn from the road to Mahabaleshwar from Poladpur. Since, the entire stretch of road is asphalted, State-Transport buses take you upto the base of �Tehalni Buruj,� where there is a parking bay. �Pratapgad Darshan� bus service is available from Mahabaleshwar. Tele # : (952168) 70110. Various Restaurants are there on the fort. Perennial source of drinking water is available on the fort. The fort can be visited throughout the year. However, nature lovers can enjoy the lush greenery just near the end of rainy season.